I am publicly endorsing Congressman Ron Paul for President of the United States. He wants to abolish the Federal Reserve and establish a sound money system in the United States. It is true that his foreign policy is isolationist, but when the dollar becomes worthless, the troops will have to come home anyways. So either Ron Paul brings them home now, or any other candidate, who will continue the status quo with the secret Federal Reserve Bank in charge of US money, and they will be stranded in the various countries where they are stationed. 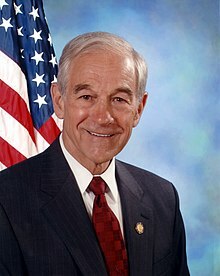 Ron Paul will try to abolish the IRS. He is the only candidate who wants to do that (to my knowledge). Therefore he is the candidate of choice for Americans Abroad who are being persecuted by the IRS. I won’t be voting because I’m a Canadian. But I have a horse in this race. Obama and any other Republican candidate will continue to make me an economic refugee, and I will not be able to support the US economy as an investor. So elect Ron Paul, and put Douglas Shulman and Benjamin Bernanke out of jobs!